This entry was posted in Boots Happy Snaps and tagged Allen Jacovich, Brett Allison, Crosisca, Footy, Fruity, Great Southern Stand, Mark of the Year, MCG, Melbourne, stadia by theholyboot. Bookmark the permalink. For some unknown reason I went to that Melbourne v North game and saw Jako’s scissor kick goal. I think he got about 8 that day, a phenomenal (wasted) talent. He used to play golf at Wattle Park where I worked and he got to know the boss. Sold him a set of clubs which he didn’t pay for and then he skipped off to Darwin. But he had the gift of the gab and no doubt got away with stuff wherever he went. When I think of the ‘G in that state I also think of Brett Allison’s mark over Gavin Crosisca. 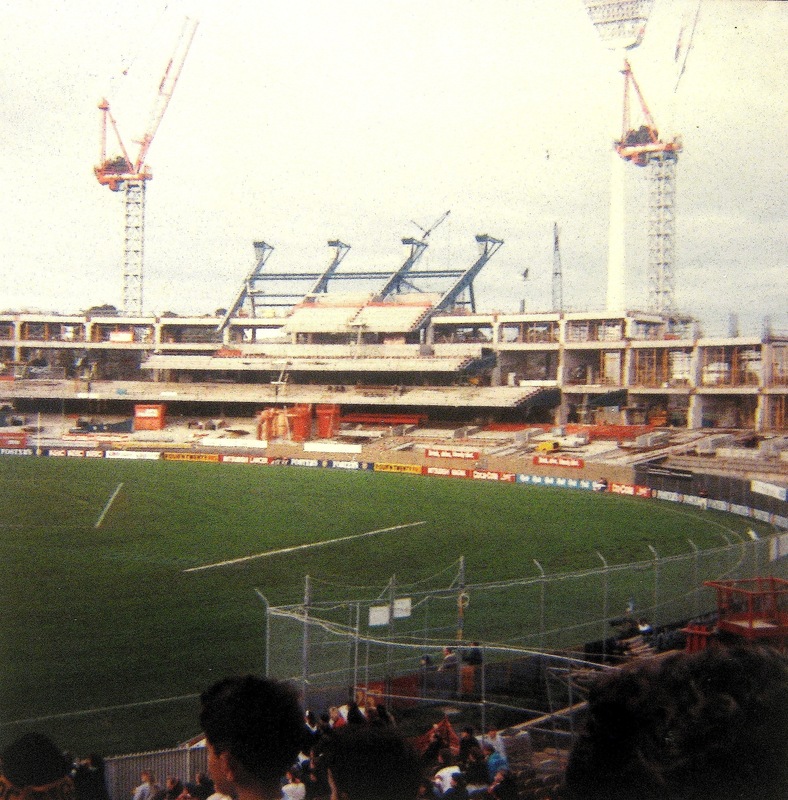 Was a fan of the old Southern Stand… the roar from the Richmond fans was amplified by the old roof that leaned over and hugged the top deck. You could hear that roar as it raced around the top deck from Punt Road to the Ponsford. When we were a force, it was awe inspiring. Was a sad time to see it coming down, as it was also a real “people’s stand”… no members areas, no corporate boxes, just great viewing for the masses. You dont get that now… any prime positions are locked away. In a way, the loss of the old Southern Stand reflected a change in Australia… no longer the sporting nation of “a fair go for all”, but more the sporting nation of “a fair go…if you have the money”. So he knicked off with the clubs?!? You’re right about being a wasted talent….but perhaps that’s why his legend lives on? I also think of Adrian McCadam that way. And of course, Brett Allison’s hanger. I’ll guess that you saw this one live too? I’ve added a clip of it above. And AFL Footy Maths….could not agree more re the old Southern Stand. It’s where I cut my football watching teeth and the atmosphere is completely unmatched today. I loved the dark and dingy nature of it, and it was oh so Richmond down the Punt Road end. And you’re spot on about it being the peoples stand….no glass in sight!